The Iranian intelligence minister has announced that his forces have disbanded about 120 terrorist groups and confiscated large amount of explosives across the country in the past four years. 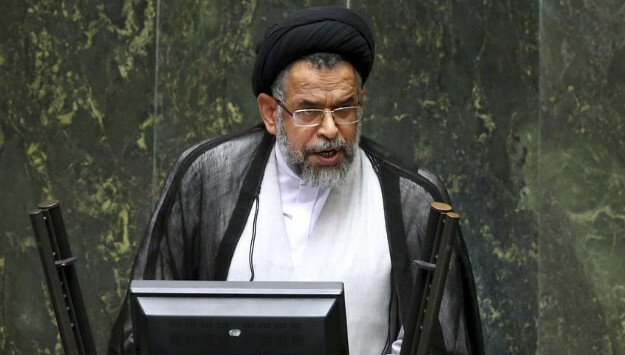 President Hassan Rouhani has retained Seyed Mahmoud Alavi as the minister of intelligence in his new cabinet. Defending the track record of the Intelligence Ministry over the past four years at the Iranian Parliament on Wednesday, Alavi said the ministry “has dealt effective blows to 120 terrorist groups and killed many of their influential ringleaders.” He also revealed that the Intelligence Ministry has been put in charge of dealing with all security-related crimes in the cyberspace and stressed that his forces closely cooperate with other relevant authorities. According to Alavi, the Intelligence Ministry has killed several prominent terrorist leaders such as Abu Hasib Balouchi, Abu Ayesheh Kordi, and Abu Farsan. He further pointed out that Iranian security forces have discovered and neutralized three tons of explosives and thousands of weapons, suicide vests and other explosive material. Comment: The Iranian intelligence minister’s remarks contradict Iranian leaders’ claim that the Islamic Republic is an “island of stability” in a troubled region. While Iran has not suffered the level of violence and terrorism seen in some of its neighbors, the latest spate of arrests and the June 7 Tehran attacks indicate that the Islamic State has infiltrated Iran and has managed to recruit among the country’s disenfranchised Sunni minority population. Earlier this month, Alavi reported that the Iranian security forces had arrested 27 terrorists linked ith the Islamic State. A statement released by the ministry claimed that the terrorist group planned attacks in Iran’s strategic provinces and religious cities, and that Iranian intelligence agents also confiscated weapons and explosive material the militants were attempting to smuggle into Iran. The ministry pointed out that the counterterrorism operation was successful as a result of cooperation with the intelligence agency of a regional country, but it did not reveal the name of the country or the location of the operation. “In this regard, 10 individuals were detained in this group’s training base on the other side of the borders, while 17 others were arrested inside the country,” the statement added. Similarly in May, Alavi announced that the country’s security forces had identified and disbanded about 30 terrorist cells over the past Iranian calendar year, which ended on March 20, 2017.